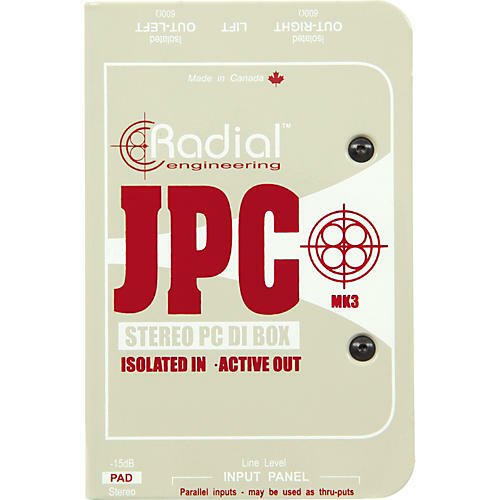 The Radial JPC DI Box is a two-channel hybrid direct box designed to address the demand for interfacing computer sound cards, consumer electronics and other gear to professional sound systems. The JPC features two active 48V phantom powered channels in a compact, rugged enclosure. It combines an active drive circuit, for long cable runs, with transformer isolated inputs to eliminate hum and buzz caused by ground loops. Multiple input and thru connectors for great versatility include 1/8" stereo, 1/4" stereo and RCA. Transformer coupled inputs have the unique advantage of isolating the 'source' from the 'destination'. This proven approach eliminates 60-cycle hum and buzz caused by so-called ground loops when two pieces of electrically powered devices are connected together. Because the active circuit does all of the impedance conversion and balancing, a dedicated 1:1 transformer can be used. This results in a hybrid design that is at once great sounding, compact and more affordable. As with all great designs, simplicity is a fundamental trait and the Radial JPC certainly fits the bill. A choice of stereo ¼", 1/8" and RCA input AND thru-put connectors make interfacing a snap with all types of equipment. A single switch inserts a “10dB pad, two power LEDs confirm 48V phantom is turned on, and a pair of XLR output connectors round out the feature set. Of course like all Radial products, the JPC is built to handle any environment. The book-cover wrap-around sleeve design protects switches and connectors from damage while the 14 gauge steel I-beam construction eliminates stress that could torque the PC board and cause solder joint failure. A full-bottom no-slip pad provides electrical insulation and mechanical isolation with plenty of 'stay-put' for use on hectic stages. And with its baked enamel finish, the Radial JPC will continue looking great for years! Twin RCA connectors are great for connecting DVD/CD players and video machines. RCA thru-puts for flexibility. Book-end design creates a protective zone around the switches & connectors “ Indestructable 14-gauge steel construction. Ground Lift switch - recessed to prevent accidental operation. Disconnects the ground path to the transformer at the XLR output. This is used when a ground path is made at the input side such as with a computer or rack module. Twin balanced XLR male output connectors; AES standard with Pin-1 ground and Pin-2 hot.